Beyond Where You Stand: Safety Last! The scene at the right, from Safety Last! starring Harold Lloyd, is one of the most famous in movie history. While you might be quite familiar with it, perhaps you don't know that the entire last twenty minutes of the movie is just as astonishing. 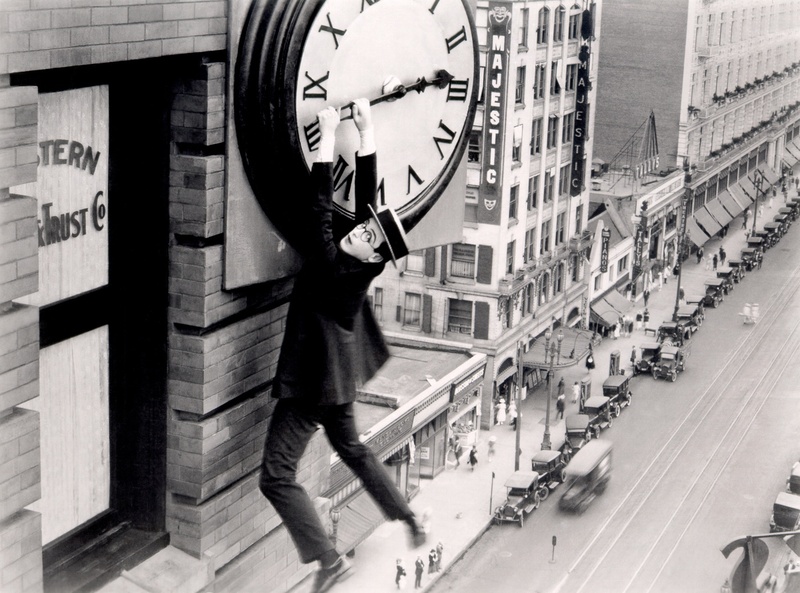 Mr. Lloyd, one of silent cinema's three widely acknowledged geniuses (Charlie Chaplin and Buster Keaton being the other two) climbs a twelve story building from ground to roof, the famous moment with the clock just a brief interlude in a much larger spectacle. Having just seen the movie in a theater recently, I was amazed by Lloyd's ability to craft a sequence that was simultaneously hilarious and thrilling, an art that contemporary movies seem to have abandoned. I have never been to a movie in which the audience was so audibly caught up in the suspense, gasping and groaning and shrieking at each development. Heightening the thrills was the fact that, not only a person actually making that climb (no CGI back then), but that it was Harold Lloyd doing it. Both the climber and the street many floors below are clearly visible in nearly every shot, many of them close ups on Lloyd's bespectacled face. This is basically the equivalent of watching George Clooney or Meryl Streep or Robert Downey, Jr. actually scaling the side of a building. Though Lloyd has had homages aplenty (Scorcese's recent Hugo, for instance, or practically every movie Jackie Chan ever made), it's tempting to say that they don't make 'em like they used to. As I dwell on it, though, I'm not sure they ever really made them quite like that. Safety Last! is one of a kind.